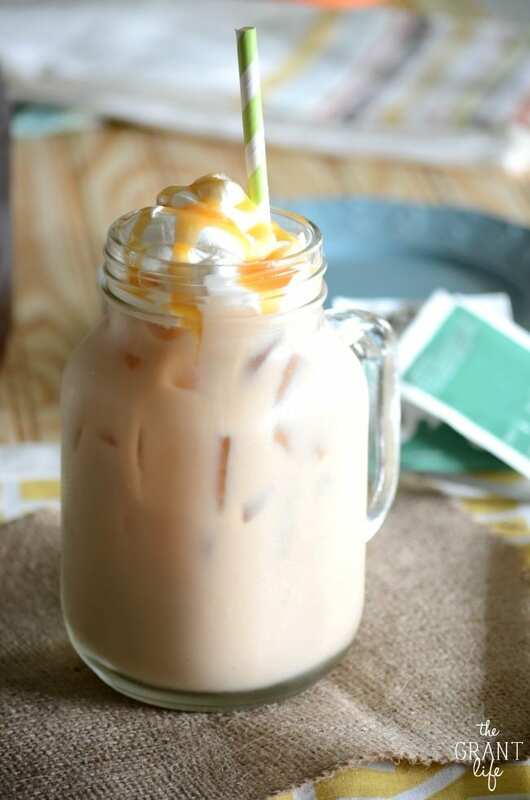 Do you love picking up a sweet iced chai latte from your favorite coffee shop? Me too! 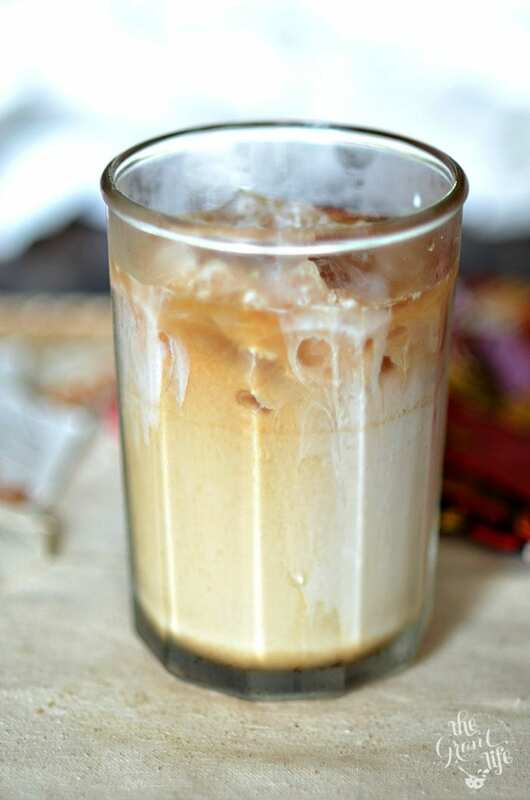 But guess what – you can make this homemade iced chai latte – Starbucks copycat version – at home! 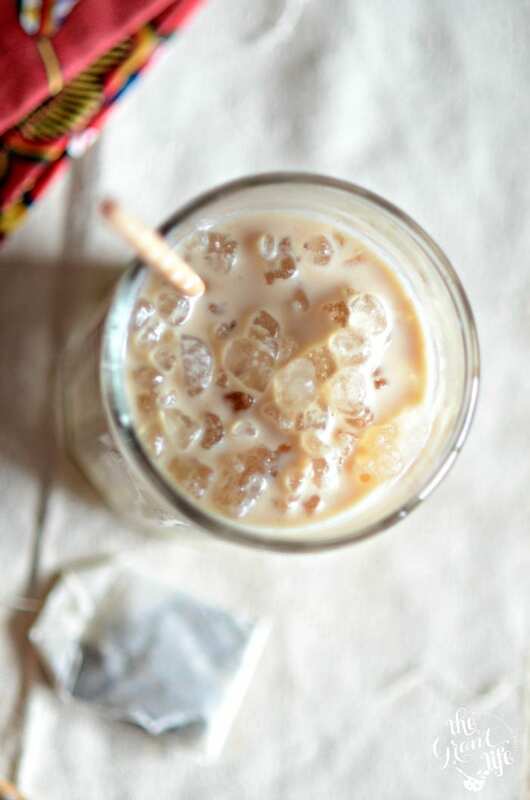 I love chai tea latte recipes and I am excited to share this super easy version with you. One of the great things about Ryon is he always has coffee ready in the morning. [Always.] We are coffee lovers in the Grant house [the adults anyways] and its how we start our mornings. Throughout the day sometimes as well. And I like good coffee. You know, the have to wait in line and promise your kids cake pops kind of coffee. 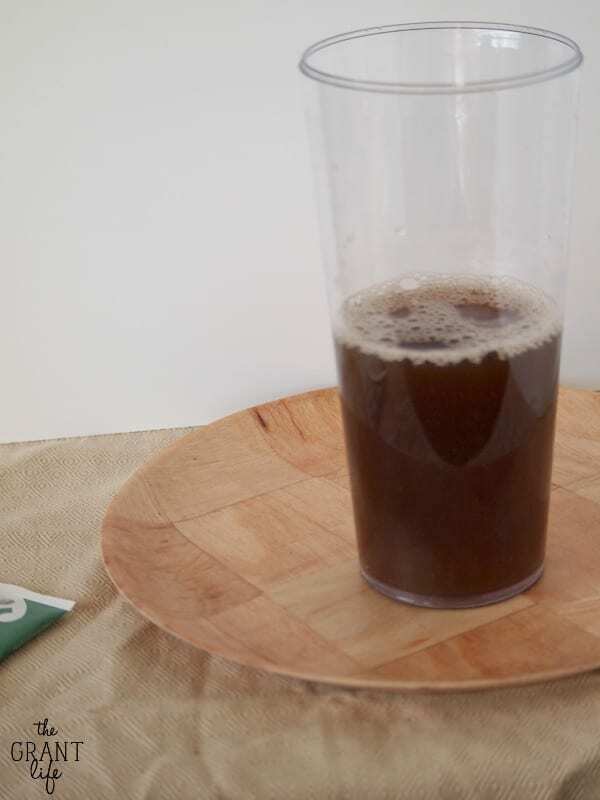 After ordering an iced chai latte one afternoon I decided to ask Dr. Google – what’s in this stuff that makes it so good anyways? And his answer was two little magical ingredients and a pinch of love. Pssst.. want more easy coffee recipes? Sign up for our emails and get a free coffee e-book! I made a whole pitcher of chai tea and just added my milk when I was ready for a latte. So to make a pitcher I boiled 8 cups of water on the stove top and added 8 chai tea bags. I let them seep for about 30 minutes and then removed them. I poured the cool chai tea mix into a pitcher and put in the fridge overnight. [Note – you can add more or less chai tea bags to your boiling water depending on how strong you want it flavored.] Don’t forget to add your pinch of love. The next morning I filled my glass half way with the cold chai tea mix and then topped it off with almond milk and ice. I stirred it around and enjoyed my first iced chai latte in my jammies. [And crazy bed head.] I really liked the drink before but I loved it after my first sip. Being able to make my own anytime for a fraction of the cost just rocks. Cafe coffee for pennies? That my friends, is some good coffee. -What brand of tea do you use? I use the Tazo chai tea brand tea bags. You can use any type of chai tea that you prefer. If you’d like you can also buy the Tazo chai concentrate and just add milk for an easier recipe. No, it’s unsweet. Feel free to add sugar or vanilla syrup to your drink. I used a sweetened vanilla almond milk. -Is this a coffee drink? Nope! It’s black tea! In fact chai means tea. Boil your water and add the tea bags. Let them seep for about 30 minutes. Remove the bags and let the tea cool before adding it to a pitcher. Let chill in the fridge overnight. Pour half a glass of the chai mix and top with your milk. Add ice, stir and enjoy! This makes one pitcher of chai tea mix. It will keep in the fridge for up to a week. When you are ready for a latte - simply add your milk and enjoy! 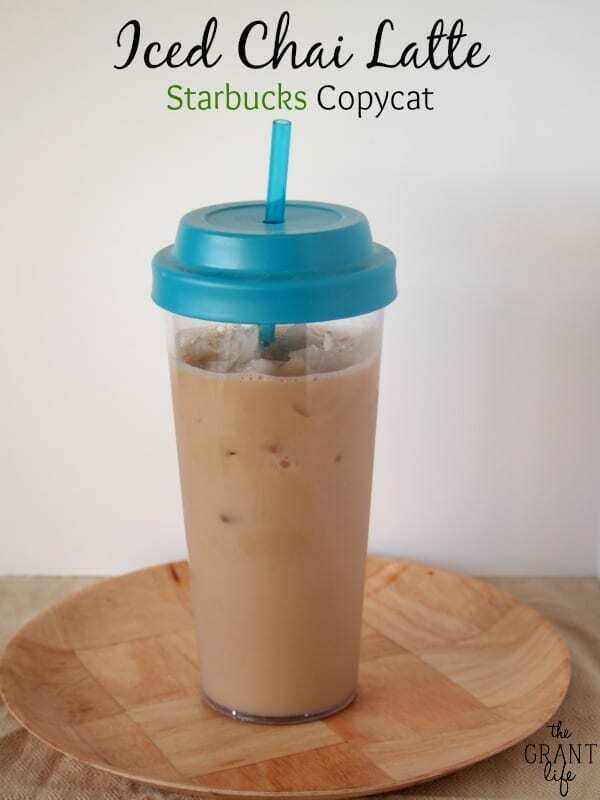 Iced Caramel Macchiato – Another Starbucks copycat! 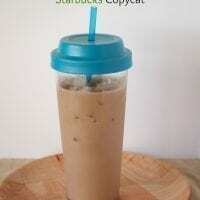 [New Recipe] – Iced vanilla chai latte! And be sure to sign up for our emails! I love this recipe and make it all the time. I decided to update the pictures one day and share them with yall. Also, if you want to know even more about chai tea lattes and want extra recipes, check out my chai page. It’s full of chai goodness! This’ll even be cheaper than buying the chai concentrate! Might even taste better, I’m gonna make it soon. Hi! I was just wondering what brand of tea would be good for this? I used the Tazo brand (which is the same brand that Starbucks uses) but you can use any. I think I paid $5 for a box on the Tazo, which isn’t too bad. Hope that helps! The Iced Chai Latte sounds delicious. I am definitely going to give it a try. I never go to Starbucks because of the prices. I have purchased Tassimo’s Chai Latte (hot) and love it, but that too is pricey. Yup. I understand that! I bought a box of Tazo Chai Tea for $5? Maybe cheaper. But you can use any chai tea and just add your milk. Its super easy and sooo much cheaper! Haha! Cheap chai lovers unite! 😉 I hope you enjoy the recipe! Thanks for your recipe. I have made my own before and used vanilla soy milk – it is good, too. Right now I am still drinking hot drinks with it being cold out – will make this in the summer when it is hot again. You’re right. No coffee in this one. The chai tea has plenty of caffeine to keep ya going though! This looks delicious!! I would love it if you shared at our Link It Or Lump It Sunday Party! Thanks Sonnet! Ill be sure to stop by. Thanks for sharing this with us on foodie friday. I am a big chai fan. Me too! My pleasure, thanks for the party! Thanks Jennifer! I hope you enjoy it if you try it! Have fun and don’t forget to join us each week! I make my own chai tea powdered mix( like a cocoa mix) . then I just add hot water. It would work for this for a cold drink too! Ohh I bet it would work great! I need to try my and make my own chai! A Chai TEA latte is not coffee. It’s caffeinated, yes, but that is from the caffeine in the TEA. It is most decidedly a tea latte, not coffee. Ooops. You’re totally right. I always forget its not coffee but tea! Thanks for the reminder! I love Chai tea so I’ll be this is amazing! Thanks! It was actually a tumbler I received from Seattle’s Best a few years ago. I just searched for it online and I wasn’t able to find it. Sorry! For those of you in the west, Oregon Chai Tea is soooo delicious! LOVE me some Chai Tea Latte! I do this routinely at my home, but try purchasing a small handheld frother (you can find them online from $10+). It will give it that perfect Starbucks finish! thanks so much for the recipe!!! big chai fan over here 🙂 do you sweeten your tea at all? I used lipton and it was so bitter. Any spice I can use to sweeten it? Im going to look for the brand you used. I’ve been making my own chai lattes for years. I use Oregon Chai concentrate, it’s a liquid. Half chai/half milk. I heat mine in the microwave for hot in cool/cold months or over ice in summer. Much better than bags or powder. They have several type Chais, for example: caffeine free. I pay $3.49 at Walmart for a container. It is Excellent! You can play around with the concentrate/milk ratio. I like a bit more chai than milk. I do not like Tazo. I hear Ophra has her own brand of Chai now. I’m not sure if you can get Oregon Chai all over the states. But it’s delicious and no need to sweeten it. I think I’ve seen Oregon chai before – I’ll have to pick up a container next time I’m out! how would I make this like a frappe? Just blend with the ice? yup! That would do it! And sounds delicious! Two Questions? Is it me, that the taste is different when I boil the Soy Milk or Almond Milk to drink my Chai tea hot? And when you prepare your Iced Chai Tea concentrated do you add any water or just half milk & half Chai tea? I haven’t tried it with the boiled soy or almond milk, but it does give my regular milk a different taste. Not bad, just different. And I use all water on the concentrate. Hope that helps! Try this with coconut milk. Not the sweetened kind in a can, but in a half gallon carton with the almond and soy milk in the dairy section. It adds a nice bit of sweetness naturally. I’ll have to try that.. thanks! I am in love with this drink but do you know if it is the same things as a vanilla Chai latte with half and half? Hey Jessica! No, it’s a little different. 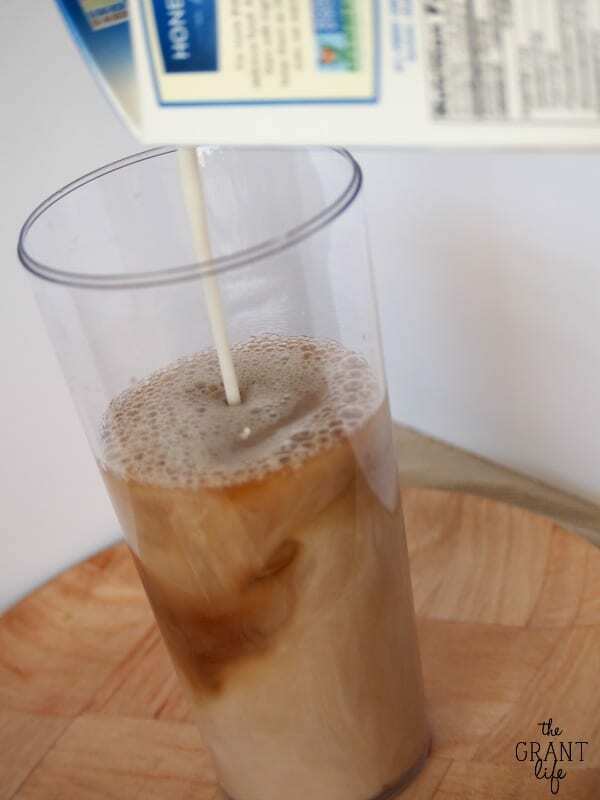 This would be more similar to what you are looking for – http://thegrantlife.com/vanilla-iced-chai-latte/ – just substitute the milk for half and half. Hope that helps! Stumbled on this in Pinterest! I LOVE LOVE LOVE starbucks and ice tea! Do you have any idea if I could use my own chai mix? Thanks, Kelley! Hey Dea! You sure can. Just make a cup of tea with your mix and add your milk of choice. Easy peasy! Hope you enjoy! I am so excited for this! My chai is all ready for tomorrow. The Starbucks Iced Chai Lattes are so good but SO expensive! Thanks for sharing! Nice website!! Awesome! Hope you enjoy Adelaide! I may just have to try it. Its got a little bit of a bite to it that normal tea doesn’t have.. but it’s very good! I hope you try it soon! Ohhh I did not know that! Thank you so much for sharing! This is not coffee, it’s tea. It’s both a pet peeve and comical when people say “ Chai Tea” since Chai means Tea. Huh – I did not know that. Thank you for pointing it out!